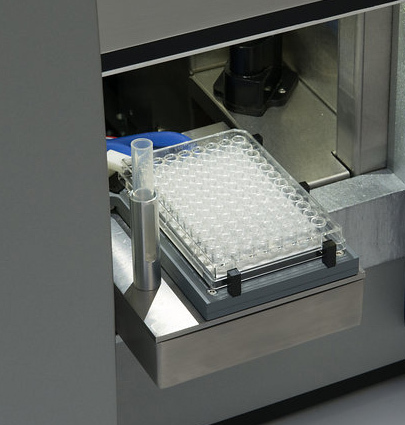 State-of-the-art, integrated high-throughput sample loader can easily handle your samples in any type of microtiter plate up to 384 wells, including standard or deep 96 well, 5mL tube racks, and single 5mL tubes. Sample integrity is maintained with on-board agitation and temperature control. ZE5 can be configured with up to five spatially separated lasers and 30 detectors providing the flexibility you need for multi-laser fluorescence detection without compromise. Its dual Forward Scatter design allows either simultaneous standard and small particle detection or multi-laser scatter detection. 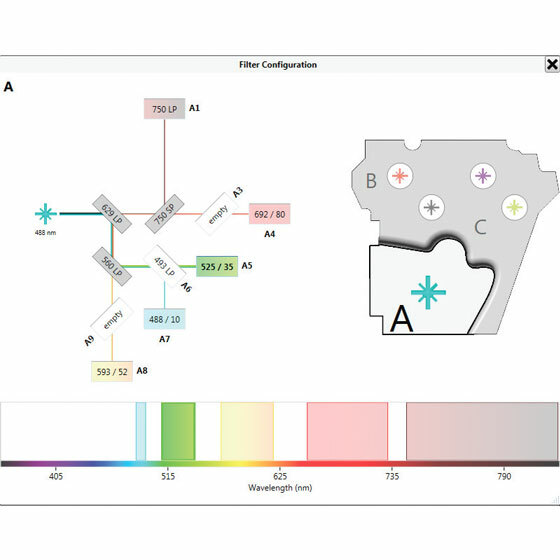 The innovative EYE profiles your instrument with 10 distinct wavelengths of LEDs to verify the optical filter configuration and track detection performance over time. Propel Labs’ intuitive EVO software provides unattended start-up and quality control, automated fluorescence compensation, a fluorochrome selector panel, and a runlist design wizard. Integrated training modules, remote access capability, and the ability to analyze files while acquiring saves time and streamlines your workflow. I am excited to see so much analytical power in such a small package. 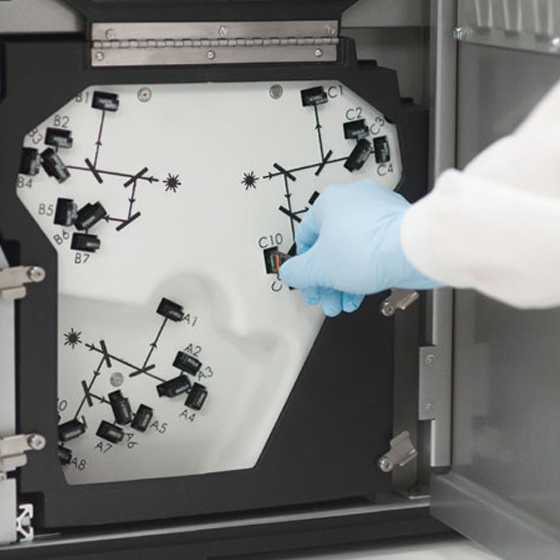 Fully automated acquisition enables sampling from 5mL tube racks and any type of microtiter plate up to 384 wells including deep well plates and custom configurations, giving you the flexibility you need. Patent pending automatic probe calibration and built-in crash detection increase up time and reduce service needs. Integrated, programmable wash station reduces carryover and time between samples improving the quality of your data and increasing the capacity of your lab. 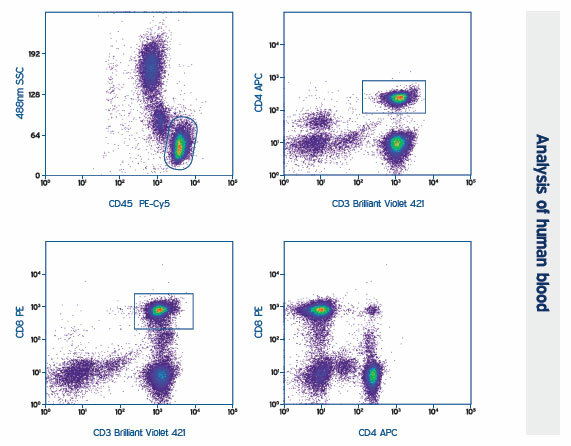 Time-saving high throughput mode can analyze a 96 well plate with < 0.5% carryover in less than 15 minutes. Temperature control maintains the integrity of your samples from start to finish. True plate shaker agitation resuspends your samples, reducing clogs. Volumetric sample uptake allows automatic concentration calculation and absolute counting without beads. No dead volume requirement, no wasted aspirated sample, and the ability to automatically return unused sample to the tube or well eliminates wasted sample. 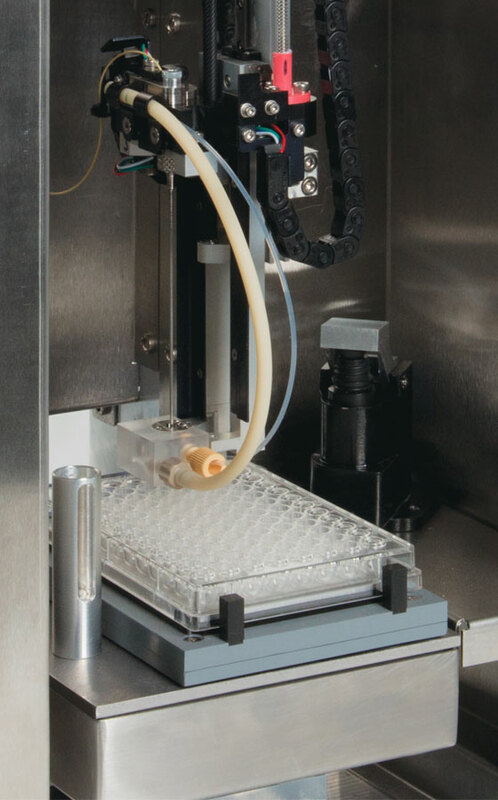 Single tube load position provides the flexibility to interrupt a plate, run one sample, and resume the microtiter plate to streamline workflow. Add reagents real-time to your samples for kinetic experiments. On-board calibration beads provide automated QC without user intervention to reduce setup time. Volume tracking for on-board beads provides an alert when replacement is needed and helps conserve usage to reduce consumable cost. Innovative continuous sampling allows unlimited volume acquisition at a stable flow rate. ZE5 offers free-space excitation with up to five spatially separated lasers ranging from 355nm to 640nm, allowing optimal wavelength selection for your multi-color experiments. Integrated beam shaping and focusing optics for each laser increases excitation stability. With up to 28 fluorescence detectors, ZE5 has out-of-the-box flexibility for your multi-color applications. 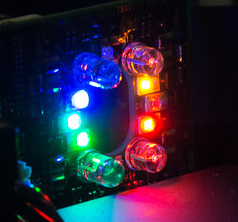 Rapidly verifying the correct optical filter configuration and tracking the detection performance over time, the patent pending EYE profiles your instrument with 10 unique wavelengths of LEDs. EYE technology enables system to system detector calibration giving you consistent experiment results between multiple instruments. Dual forward scatter design allows standard FSC detection while simultaneously collecting small particle or alternate wavelength scatter data. 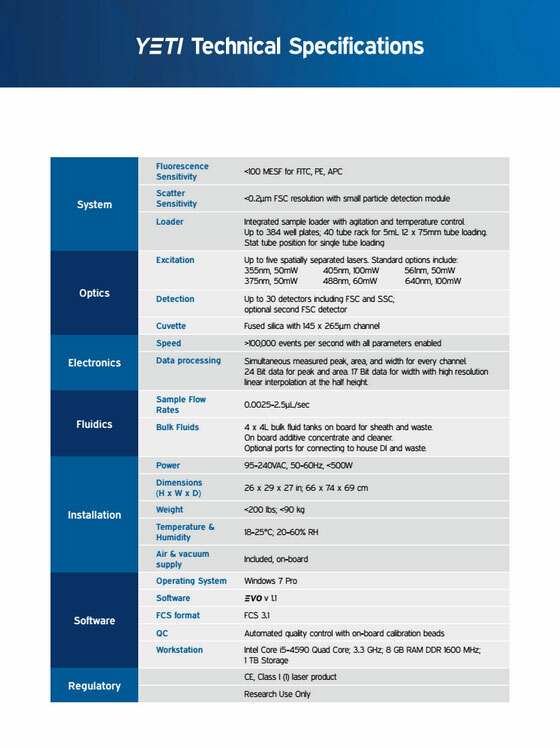 Field upgrades are simplified with modular excitation and detection components. Patent pending sample delivery system allows stable, continuous flow from 0.0025 to 2.5 µL/s and provides a direct path from sample to flow cell. 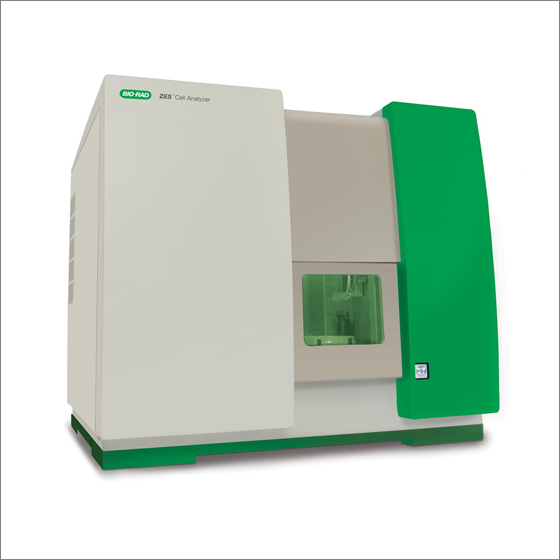 High velocity sheath flow delivers unparalleled analytical throughput to collect more data in less time. 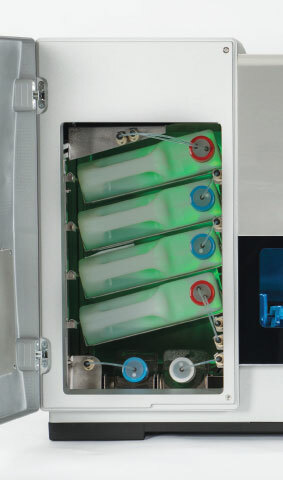 Hot-swappable bulk fluid bottles allow uninterrupted system use. Built in ports to connect to a house DI and waste system can eliminate the need to fill and empty bulk fluid tanks. On-board cleaner and additive bottles allow dilution for sheath fluid with an anti-microbial and surfactant as well as hands-free automated cleaning and rinsing. Bi-directional flow to the cuvette provides built-in high pressure unclogging and cleaning capabilities. Sleep mode conserves laser hours and fluids when the system is not in continuous use. 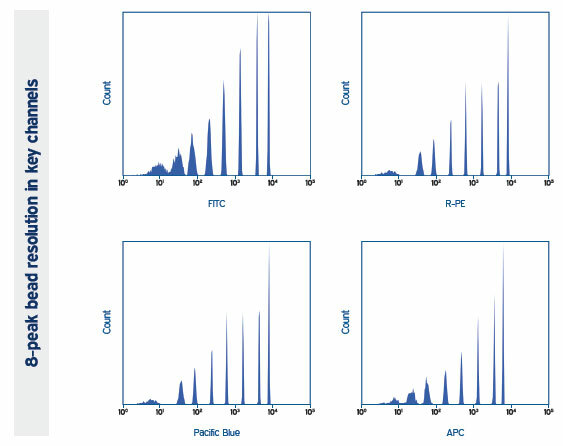 Measured peak, area, and width parameters available simultaneously for every channel to accurately characterize samples. Proprietary digital processing with 24-bit data maximizes dynamic range and reduces channel noise for superior dim population resolution. Zero dead-time processing with dynamic window extension ensures full data collection for every sample. Massively parallel, pipelined architecture eliminates hard aborts to provide more data in less time. Unassisted laser delay system configures optimal delays with no user interaction. Real-time hardware system control enables accurate, repeatable sampler operation. Scheduled startup and quality control eliminates waiting for system warm up. Elegant and intuitive user interface with quick action buttons of suggested next steps to simply use. Fluorochrome selector assists with experiment design and work list setup giving users a head start. Automated PMT voltage adjustment and compensation simplifies and shortens the setup required for multi-color experiments. Adjustable region based event monitoring ensures the quality of your data from well to well. Remote monitoring, status and control from your phone or tablet give you the freedom to walk away from the system. Acquire and store files with up to 100 million events with all parameters enabled at high speed, reducing rare event detection time. Analyze saved files while acquiring new data to improve your workflow and reduce analysis only time on your systems. Patent pending Threshold plot you everything the electronics see to give you full confidence in setting the proper threshold. Multi-channel triggering gives the option to use a combination of inputs for complex experiments. 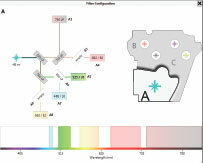 Custom heat map display gives a visual presentation of acquired data for plates and tube racks to quickly and clearly summarize experimental results. Analysis features including overlays, color-gating, and ratio provide the capability to display data in the way you choose. Batch analysis allows quick summaries and reports for multiple samples reducing the tedious work of manually opening and analyzing individual files. Publish features provide flexible outputs and high resolution images to export and present your data with ease. Integrated tutorials guide new users through the software basics, runlist creation, compensation, and advanced features saving training time. Offline mode lets you create runlists and experimental design from your desktop before sitting down at the system. Automation ready with API for integration with robotics or custom analytical systems. 4 color panel run on a 5-laser ZE5 with a 355nm/ 405nm/ 488nm/ 561nm/ 640nm laser configuration. The panel shown requires no compensation and defines T-cell subsets using lysed whole blood from a normal donor.